Designed to be easy to use, setup and maintain. Perfect for tumbling biopellets. No thumbs screws, foam pads or leaky lids common with other reactors. The reactor will hold up to 350mL (~1.5 cups) of biopellets. Suitable for tanks 75g and smaller. The BRS Biopellet Reactor features several distinct advantages over other brands. Heavy duty all plastic construction. High quality easy to use double O-Ring push connect fittings. Easy to operate, clean and maintain. High quality ball valve for precise tuning. Instantly attaches to popular pumps using included push connect or threaded fittings. 1/2" fittings and ports throughout reduce head pressure and provide ample flow rates. Holds up to 350mL of biopellets (~1.5 cups). 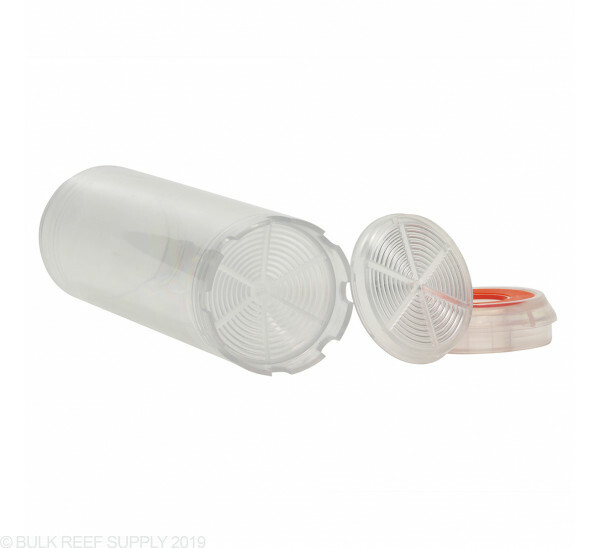 Dimensions: 14.5"H x 5.5"W x 5"
Feed pump notes - You may use a variety of different feed pumps for this reactor but there are two popular options we recommend. Sicce Syncra Silent 1.5 – This pump is highly recommended. It is strong enough to tumble the biopellets continually and will likely have to be dialed back using the included valve. This will allow room for you to turn up the flow inside the reactor if it were to slow down due to tank debris collecting in the cartridge strainer. This pump option requires the least amount of maintenance and effort. It is important to install the reactor close to the water level of your tank/sump to minimize head pressure. If it does clog you can clean the cartridge strainer as part of your standard maintenance schedule or upgrade the pump at a later date. I bought his reactor a couple months ago. At first it worked great then after about a month it would stop tumbling the media. I would clean the screens and it would work good again for awhile. Finally I took it apart and found a small piece of plastic egg crate lodged in the 90 deg inlet (my fault). Now it works as it should but still occasionally requires cleaning the screens. As in another review it works well if a proper pump is added for flow and weekly cleaning is down on the chamber screens on top and bottom getting clogged with the film. If they created a screen unique for biopellets that are bigger than that for the GFO/Carbon then it would help reduce the maintenance required. Well made and heavy plastic, hold hold up for many years, jut wish they had include a little more tubing, need to buy more locally to plumb it to work for my situation.. 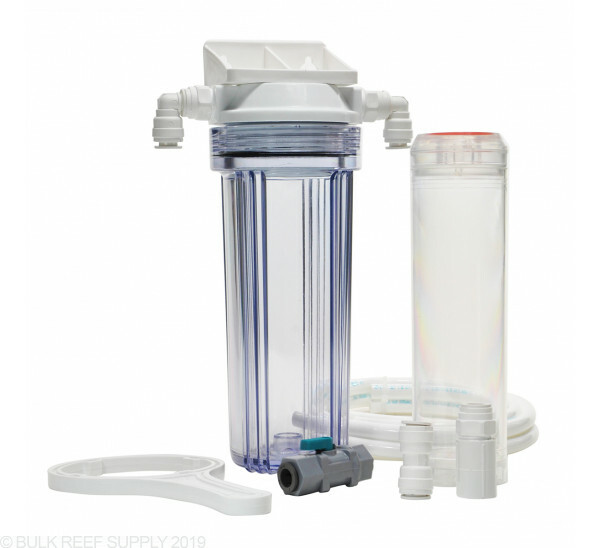 I have a 125g mix reef aquarium and after trying nextreef and two little fishes and didn't work this biopellet reactor is the perfect one,you got the tumble as you wanted it, very easy to set up. Thanks BRS. I have 1 of these reactors and 2 of the black brs ones. They are perfect for GFO and Carbon, however i dont think they are ideal for Biopellets what so ever. After just 1 week the biopellets are barely tumbling because of gunk buildup inside the filter that restricts flow. This has to be cleaned weekly to keep the biopellets tumbling. Having to do this makes it a chore so I am seriously considering a different reactor. I hope BRS will re-design this reactor so that it doesnt clog as easily. Do not recomment for BIO Pellets. Only for GFO and Carbon. The reactor is made of thick plastic and is built very well. The quick connect and swivels help get it up and running fast. Love this reactor. Works like a charm, using a maxi jet 1200 for a good flow. Old two little fishes reactor too many problems. Very happy and I'd recommend to all you reefers out there this is the reactor for you. like every BRS product i have ever bought this reactor is very high quality. like alot of people my first reactor was a converted phosban reactor powered by a maxi jet. no mater what i did i could not get a good even flow and with biopellets that is key. when i recieved my BRS reactor i was imediately impresed. i had it mounted in minutes and out of curiousity i hooked the maxijet up to it.because of the design of the reactor it had all the pellets moving. my reactor is mounted at sump level so the maxijet only has 6 inches of head presure any more i would have gone with a bigger pump.i have a much more expencive unit on another tank and like it alot but it cost more than three times as much as the BRS reactor. I have an overstocked reef tank... enough said my nitrates were always a bit high even when I did a lot of water changes. I had to do one every week to keep it at bay. My corals never really had amazing colors and great growth. I bought this product and the BRS Bio Pellets and since than my phosphates read zero! I love this thing! Only thing is that my SKIM SMELLS FOUL but i can deal with that! Hi, I have a 125 with 2-3" sandbed and not that much live rock. Maybe 100 gallons of water? I don't have a few hundred dollars to spend on a biopellet reactor and was thinking of trying this. I'm thinking it would be better than nothing, or would you see this as a complete waste of money? thanks. Unfortunately the BRS bio pellet reactor would be small and cause some head aches on a system of your size. Instead of going for a bio pellet at this point you may want to consider carbon dosing such as NO3PO4x by Red Sea which is a liquid form of food for bacteria which can be dosed. Feel free to let us know if you have any further questions! I have 90 gal total water volume. Would this be too small? Could I run to reactors? Unfortunately this reactor would be a little too small for your system. You could run two reactors if you wished, but it would be best to have them run off a tee, or parallel, rather than in series, or you may have issues with flow loss between the stages. I have a 120g tank, but this says its for 75g or smaller. could i use 2 of these inline or should i look for something else? For a larger tank I would use a larger reactor :-) Something like one of the Octopus BH or Bio-Churn reactors seems like it would be a good choice. 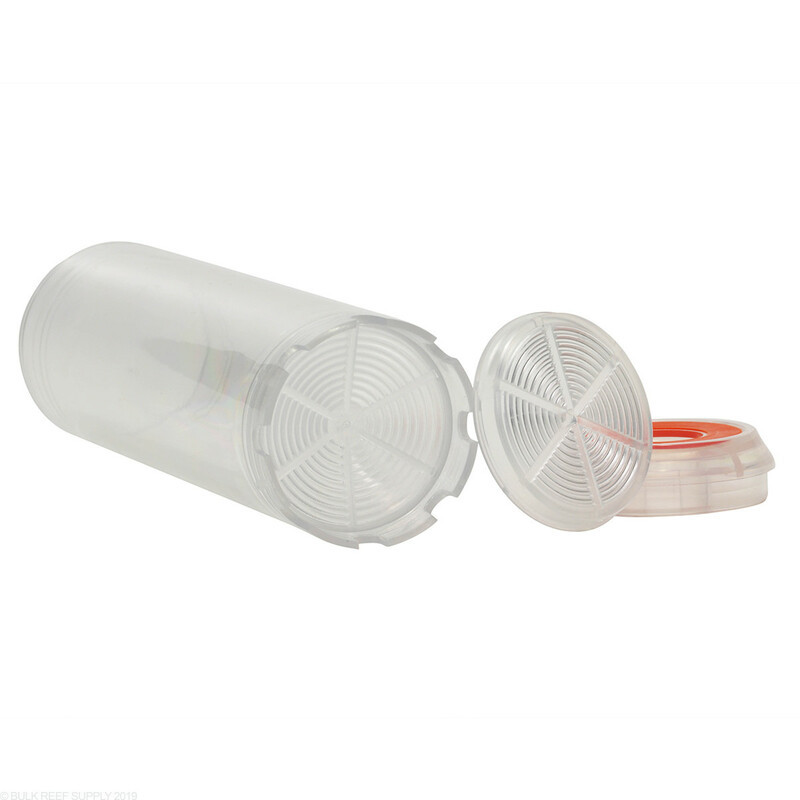 The internal cartridges are different as you don't want any foam pads in a biopellet cartridge. The biopellet reactor also comes with fittings for using larger pumps as typically something bigger then an mj1200 will be needed (like a mag drive 5 for example) and while the reactor chambers themselves are the same size, there isn't nearly the same capacity for running biopellets. Max dose is a little over a cup or so making the reactor good for tanks up to roughly 50g or so when using biopellets. Would this be the best reactor choice for use as a CO2 scrubber? I have a Bubble Magus skimmer, and would like to connect it to the air intake. For a setup like that you would actually want to look at the universal air filter. It has barb connections on it and is made for doing just that.